The movie Inside Out follows Riley, an 11-year-old-girl, controlled by personified emotions that include happiness, sadness, anger, fear, and disgust. These “characters” reside inside her brain and manage her feelings comically. Emotions were essential for early Homo sapiens. Without the emotion of fear, we might not be around today. In 1872, Charles Darwin theorized that emotions were traits developed gradually through evolution. Paul Ekman (a pioneer of emotion research) expanded on this idea by discovering learned facial expressions. Furthermore, he defined six basic emotions that are surprisingly present in all cultures. Emotions can be defined as evolutionary or behavioral responses to certain stimuli. In other words, some are innate, while others are learned. Emotions originate in the limbic system—a set of structures located between the two cerebral hemispheres and the brain stem. Emotions that are learned are stored as memories in neurons near amygdalae. These two Amygdalae have prominent roles in creating these emotions. The right amygdala detects the initial stimulus, while the left amygdala analyzes the stimulus (which allows for a more complex response). Generally, the right amygdala governs happiness, and the left creates fear. However, these mechanisms are not understood very clearly (as are many other functions of the brain). Fear is an innate emotion present through evolution. Fear is learned and stored in specific memories associated with the amygdala. Furthermore, these memories are thought to be linked to PTSD. In a 2010 study, scientists experimented on rats with PTSD. Half the rats’ amygdalae were shocked. These rats exhibited normal behavior in comparison to the amygdalae that were not shocked. The amygdala is also responsible for processing other people’s facial expressions. Damage to the right amygdala can lead to problems in recognizing fear. Inside Out revolves around the significance of sadness. It is supposed to be the theme towards the end of the movie. this can be attributed to emotional memories. For example, people may remember where they were and what they were doing during the tragic events of 9/11. In a study conducted by Larry Cahill, subjects recalled distressing video clips more clearly than neutral clips. 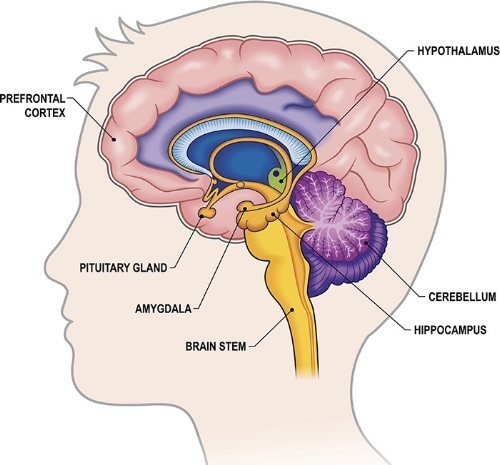 The reason is simple: the amygdala is more active when learning about sad things. This is why you remember emotional memories much more clearly. The amygdala is also influenced by certain chemicals known as neurotransmitters. These complex organic compounds influence much of the brain’s functions. Specifically, there is a high concentration of GABA (Gamma-Aminobutyric Acid) and glutamate receptors in the amygdala. GABA reduces excitability while glutamate helps creates memories. Emotions are a result of the many parts of the brain working together. It may never be fully understood. In fact, emotions are only one minor byproduct of the brain. The brain is undoubtedly the most complex organ—even in animated movies!